About 8 years ago I encouraged sophomores to take AP biology. My impression was that freshmen are too young, juniors stressed about college to focus, and senior check out mid-year. My sophomores have consistently out performed the others in excitement, motivation and scores. I do love the upper grades and my observation is a general one. That said, the downside to teaching AP biology to sophomores is they have not had chemistry. I have to drop back and teach the basics like molecules, bonding and water properties. Their chemistry teachers have not taught these yet so it falls on me to do it. I don’t mind, but it is really not in the scope of the course anymore. However, to understand complex molecular relationships, the basics are needed. So today I went over bonding and hopefully tomorrow after I check for understanding, we can learn carbon and matter cycles. In honors we used the POGIL model for introducing the basics about water and then i began explaining the properties after that. That POGIL is short and to the point, and it has an error which the kids like to find and solve. 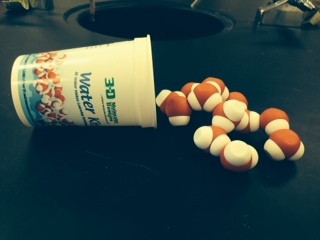 I am using the 3D molecular Designs water kits as models to teach the properties of water. These water models are excellent for modeling almost everything except heat of vaporization, specific heat capacity and surface tension. I am modifying the 3D Molecular Designs activities for AP and honors biology. I am hoping the kids will learn more from them than the water olympics activity I have done for years. I have the protein toober models coming on the 23rd so I am a little tied to a schedule to get to proteins by then. I saw this blog article on Twitter and it made an impression on me. I’d like to know more about what the students think about the article and maybe I’ll offer it as a reading in the future. This entry was posted in Uncategorized on October 16, 2014 by Bob Kuhn.